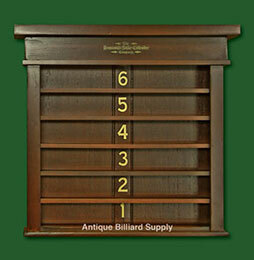 #6-10 Antique wall-mounted ball rack for use with Brunswick antique pool table. Six-shelf model with crown accent at top. Solid birch construction. Medium brown finish and gold-leaf numbers for each shelf.